This stainless steel intermediate bracket - specially designed for lifeline systems - was developed for penetration-free installation on a standing seam roof. This device is attached using aluminium or brass clamps depending on your subsurface (steel, copper, aluminium or titanium zinc). Our ABS-Lock Falz IV Standing Seam ZW ist designed for implementation in a lifeline system. It is used to bridge an obstacle to prevent the stainless steel lifeline cable stretched across it from coming into contact with this obstacle. Our stainless steel intermediate support is simply clamped onto the seam using perfectly-fitting aluminium or brass clamps depending on your subsurface (steel, copper, aluminium or titanium zinc). The clamps allow you to install the device without damaging the roof membrane. 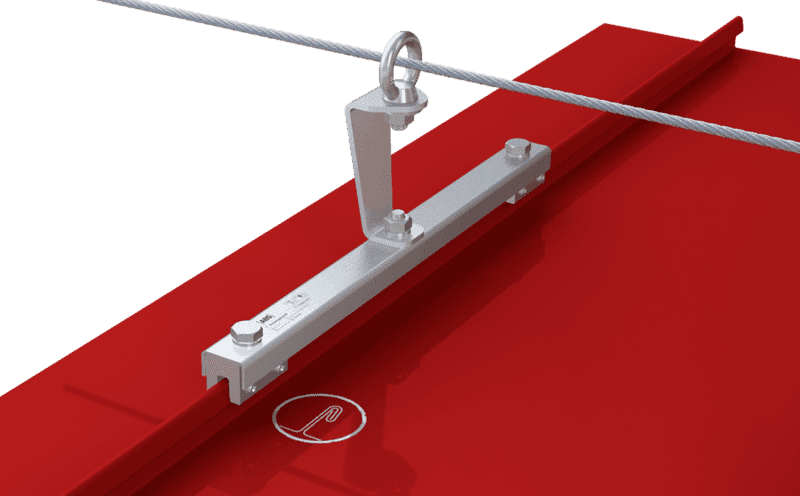 This keeps your roof surface sealed up whilst providing a reliable anchorage device that simultaneously secures several individuals working on a metal seam roof. Our ABS-Lock Falz IV Standing Seam ZW model has been certified for exclusive usage as a component in a lifeline system. If you require a single anchorage point for a standing seam roof, just click here.